Domus.Cad is a program for architectural 3D design which allows you to face 3D design with the same simplicity as a traditional 2D design, and with the same simplicity allows you not only to design but to plan an entire project directly on your computer. The new version is a program with exclusive characteristics that has nothing to fear from any other 3D architectural design program on the market. Domus.Cad is the right CAD for architects and civil engineers. It is a tool for the design and modeling of architecture, interior, landscape, and urban spaces. With Domus.Cad you can immediately begin to create three-dimensional elements without needing to start from a two-dimensional plan. Elements such as walls, floors, roofs, and stairs are created from the onset in their full three-dimensional form. Domus.Cad is intuitive and easy to learn. Uncomplicated procedures of element insertion, movement, and modification allow you to progress easily through all phases of the design process. Domus.Cad offers true interactive design capabilities. 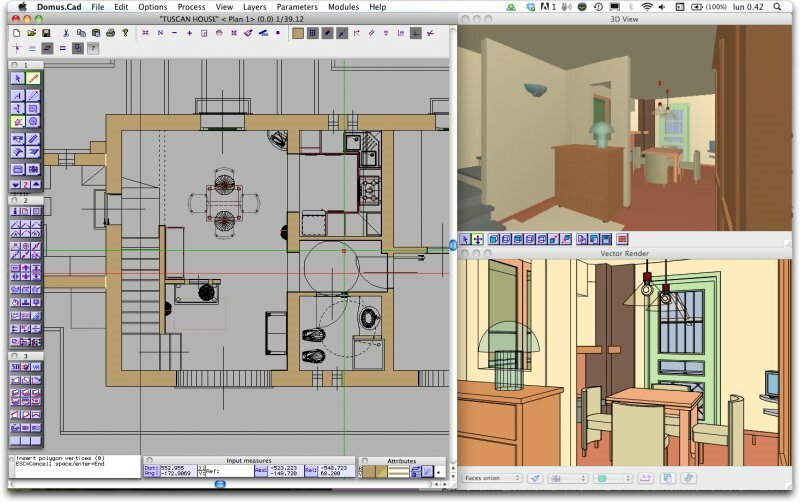 You can keep the 3D window open while you design in plan and watch the model change in real time as you draw. Domus.Cad also allows you to simulate different lighting conditions and do walkthroughs in real time, a definite plus for helping the client understand 3D architectural space. You can directly edit the 3D model elements in the 3D Window. 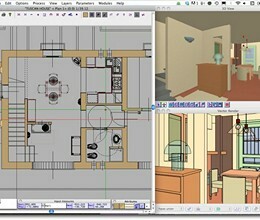 One of the most important feacture of Domus.Cad Pro and Std is the new vectorial rendering engine, that allows the user to obtain editable elevations, sections, perspectives, axonometries and in a way as the interactive 3D view, generating high quality and very detailed drawings, colored with the same colors as the interactive 3D view. The model created with Domus.Cad can be exported in 3DS format and other formats including Art*lantis, DXF 3D and DWG. A land model created with DomusTerra, Nonio C, or other modeling programs can be imported by Domus.Cad, where it may be viewed and elaborated along with the architectural model. The reverse operation may also be performed: an architectural model may be exported to DomusTerra or Nonio C (in 3DS and QD3D MetaFile format) where it can be placed directly on the modeled landscape. Importing of the most part of the graphic formats: TIFF, JPG, PICT, GIF, TGA, BMP, PNG and many others. An exclusive "fusion" process immediately joins the various wall elements, as they are placed, moved or changed, allowing a quick and easy creation of the initial drawing. Drawings can be rendered using fills and materials. Fills can be applied to both 2D and 3D elements. Fill tiles can also be used, allowing you to create your own fills. Each element may also be assigned a material containing color and reflective properties. Expandable libraries offer the ability to add additional interest. Modeling features allow you to extrude and rotate 3D forms from any drawn polygon, along a line, a 3D path or around any axes, making it easy to model furniture, building cornices, structural elements and any unusual architectural form. 2D elements like segments and polygons can be quickly and easy transformed in complex 3D object (ex. a 2D complex liberty drawing of a gate can be transformed in a 3D gate object). Domus.Cad has an internal option for multiple-sheet paging with a preview window. Drawings and images are paged directly from the various working layers. If the drawings are changed after they are paged, it is not necessary to re-paginate them, the sheet is updated automatically. A project can also be viewed at any stage of development in a series of automatically-generated 2D and 3D views (sections, elevations, axons, and perspectives). Once generated, these views can be touched up or modified directly in Domus.Cad. Domus.Cad's strong 3D capabilities are matched by its equally impressive array of 2D CAD tools. This makes it just as easy to produce a full set of presentation and construction documents as it is to create the architectural model itself. It is possible to assign ordinary Tiles or BitMap Fills to Lines and Polygons. The Tile is repeated side by side along its own “X” axis, towards the right. Specialized modules allows you to create rapidly and parametrically complex architectural elements, like spiral and helical stairs, railings, gates, roof structures, grids and others . * Domus.Cad download link provides trial version of the software for Windows and Mac OS. Domus.Cad has been rated 5.0 out of 5 points. A total of 1 votes cast and 2 users reviewed the software.